It is hard to believe that summer will soon be here! The behind the scenes work as begun in our office and maintenance shop. Our staff are getting ready to greet campers and welcome them to the O’Brien County Park system. Remember that cabin reservations can be made one calendar year in advance. Weekends tend to fill up quickly. Plan ahead to book your stay with us. Camping coupon books are available from the park rangers and also from the campground hosts at Mill Creek and Dog Creek parks. 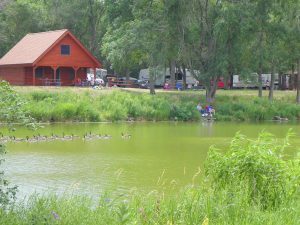 This year there will be two special events happening in our campgrounds. On July 13, we will be holding a “Christmas in July” at Dog Creek Park. Campers are invited to decorate their sites with a Christmas theme. A judge will choose the most impressive site, and the winner will receive a camping coupon booklet. On October 4 & 5, there will be a “Trick or Treat” event at Mill Creek. Campers are invited to decorate their sites with a Halloween theme. Patrons will be allowed to camp for free in exchange for serving candy to trick-or-treaters during a special event on Saturday evening. You will hear more about these events in upcoming publications.